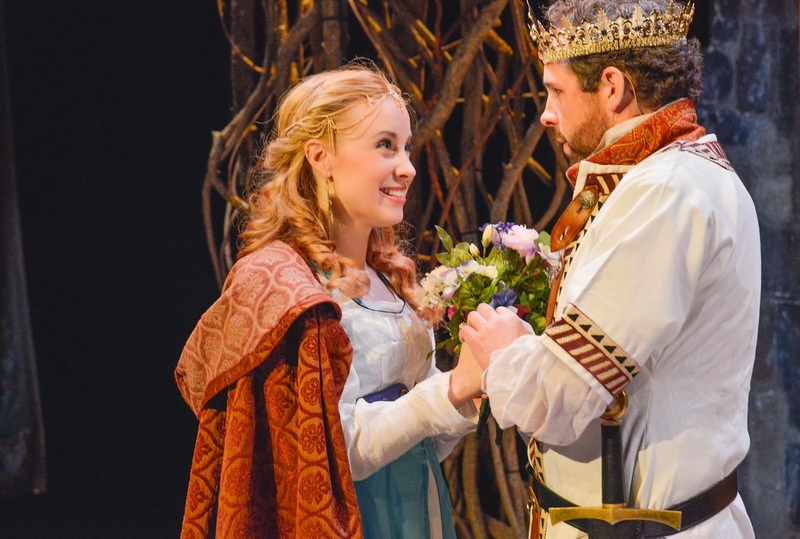 Erica Spyres and Benjamin Evett as Guinevere and Arthur. Photos: Andrew Brilliant. Boston Globe editorial policy (like most local editorial policies) relentlessly prods reviewers toward the positive, so it's a surprise when one goes rogue. Yet critic Terry Byrne definitely tore a page from the Sarah Palin playbook last week, when she blew a passionately clueless raspberry at the New Rep's Camelot - which must have sent that theatre company reeling, as it's their best show in months! Somehow the word has gotten out, though; I caught Camelot at one of the Sunday evening performances - which are often lightly attended - and found the place packed. Perhaps the show itself still has drawing power; or maybe the calculated timing of this revival (50 years from the assassination of the president who adored it) has lasting resonance. But whatever the reason, those who turned out for Camelot were treated to a subtly acted and beautifully sung performance that put a new shine on this under-rated Lerner and Loewe gem. But I have to admit the Globe was right about one thing - when it comes to acoustics, the New Rep is not a congenial spot for Camelot. But then the Charles Mosesian Theater was clearly designed by a committee, and thus suits almost nothing to a T; moreover, despite its size, it lacks anything like an orchestra pit. So for Camelot, the New Rep has tucked its troubadours up into an unseen corner, and then piped their performance back into the main space. I know. The orchestral reduction alone will jar fans of the ravishing original, and when what's left is pumped through a speaker, well . . . Sigh. The marvel, though, is that the rest of director Russell Garrett's production is so persuasive that you adjust after a song or two, and simply focus on the vocals and acting. Spyres and Koeck fall hard for each other. And here this Camelot is in clover; indeed, it showcases one of the most memorable performances of the year. Benjamin Evett has so long been hailed as one of our best actors that he can count on critical hosannas rolling in even when he's miscast or having a bad day. But this time he earns his laurels, and then some; his King Arthur is not only his best performance in memory, it's one of the best Arthurs I've ever seen (and my partner, who saw Burton in the role, was equally impressed). It all comes together for Evett this time - he ages convincingly before our eyes from boyish appeal to world-weariness, and the journey is suffused with witty, sympathetic detail and a scrupulously sculpted accent (and his singing voice proves more than adequate). His Guinevere, the lovely Erica Spyres, is only a small step behind - she may even be ahead in the first act, when she brings a glowing sense of playfulness to her part. But when "Jenny" unexpectedly falls hard for Launcelot (hunky newcomer Marc Koeck, at left) Spyres fails to find the same depth that Evett does; Lerner's libretto isn't much help in this regard, but Spyres has previously shown the kind of acting chops required to suggest Guinevere's broken, beating heart; hopefully she'll soon find her way there. She could take a cue from young Koeck, actually, whose high baritone soars in the iconic "If Ever I Would Leave You," and whose Launcelot is less a Bob-Goulet-level crooner than a kind of saint-in-training. Koeck lacks something of the physical grace that should distinguish him from Arthur - but for once, thanks to his evident innocence, his rapprochement with his royal rival is actually touching. Elsewhere Nick Sulfaro gives the malicious Mordred a shot of infectiously twisted glee, while Robert D. Murphy makes an amusingly stolid Sir Pellinore (though his Merlyn isn't nearly far enough "out there"). Likewise there are strong supporting turns from Michael J. Borges, Maurice Emmanuel Parent, and Katie Clark, while the chorus does yeoman duty in everything from jousts to gymnastics (director Garrett's choreography galumphs a bit at first, but he puts over his big numbers). I was also taken with most aspects of the physical production - again, the Mosesian stage is a challenge, but John Traub's set (turrets that morph into thickets) solved many of its problems, and Rafael Jaen's costumes were generally gorgeous (and his color palette was superb), even if Launcelot could have lost a scarf or two. Of course there are those who simply have it in for shows like Camelot these days. They're too white-bread, too romantically sexist ("How does one handle a woman?" wonders a dated lyric) - too whatever. And admittedly there's no new concept here to distract these types - nor is Camelot flawless; librettist Lerner sometimes sprints like a hare to cover the greensward of Arthurian legend, all while hanging onto the operetta-like romance on which he and Fritz Loewe can drape their love songs. So the show often abruptly shifts gears - and yet every time I see it, I'm struck by just how well most of it hangs together. No, it's not in the top tier of Lerner and Loewe's achievement - but then that top tier is My Fair Lady. It remains, however, a charmingly civilized entertainment. Which is just what King Arthur would have wished. HA! When Terry Byrne reviewed NSMT's CAMELOT in 2005 she complained that Lancelot's French accent was a "bit much" ... needles to say the actor was from France! Goes to pattern, your honor . . .